Joseph gives us his insight in to the best electronic drumkits on a budget. Electronic kits. There are all kinds of reasons they’re an appealing option when looking for drums. It may be that you’ve had one too many noise complaints from your neighbours. It may be that your child wants to get into drumming, but you’d rather go deaf in your own time. Or it may just be that you like the expanded sound potential you get with using an electronic kit. Brilliant! The only problem is that these electronics aren’t always cheap. So how do you choose the best budget kit? Well, here I am. I’ve had a look at the four best budget kits (under £600) for you to help you choose! With mesh heads instead of rubber pads, the CSD500 has a more true-to-life feel than other kits in this range. With over 450 sounds, 29 preset drum kits and the ability to make 12 user kits, you get a significant amount for your money. The module comes with 20 demo songs, midi in/out for recording and even metronome. Add on top of this the three-band EQ and ambience and reverb settings, this kit is surprisingly customisable for the price. 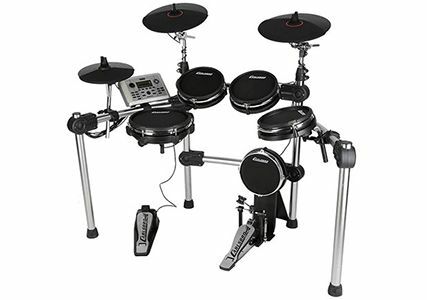 Roland’s V-Drums are massively popular and are widely held to be the best electronic kits in the world. 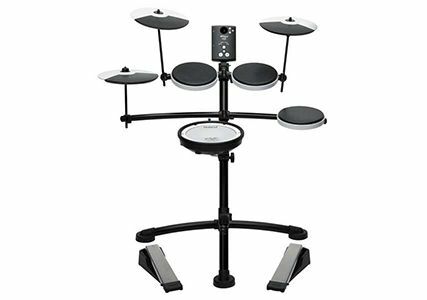 The TD-1KV is the V-Drums entry-level compact kit. The obviously great feature of this kit compared to the others is its compact nature, so if space is your issue, look no further! Not only does the kit comes with Roland’s highly-popular sounds, the module also includes built-in learning features, as well as the option to record and playback your playing so you can monitor your progress. Opposed to rubber pad on the TD-1K, the TD-1KV comes with a mesh head snare drum to give you that more realistic feel. If you buy this kit as a bundle at Wembley Music Centre, you’ll save £20! 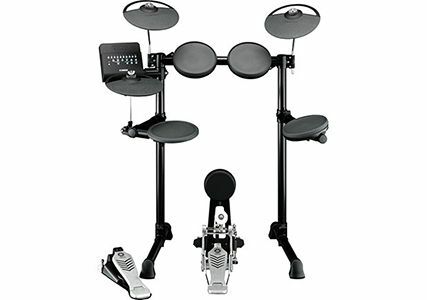 Check the bundle out here: Roland TD-1KV Bundle. Like the CSD500, the Forge 8-Pad, does indeed, have 8 pads. The importance of this depends very much on the reason for buying an electric kit, but if it is to have a realistic feel, the 8 pads can replicate the layout of an acoustic kit! The Forge module is more advanced compared to its competitors in this price range and boasts 600 sounds, and 70 full drum kits to cover a wide range of sounds. It does have rubber pads which are less realistic in feel but don’t hinder practising sticking of any kind. The Forge 8-pad comes with drumsticks and a drum key so you are all ready to get playing! As the cheapest in the list, the DTX450K is both a money saver and a space saver. With 169 drum sounds, 127 percussion sounds, 10 practice tracks, and various training options, with this kit you’d be set. Though the snare head is rubber, it is three-zone meaning that you can play different expressions to replicate the feel of playing a real snare. The rack is even slightly larger so that, if you wish, you can add an extra cymbal in the future. Though a remote pedal, the hi-hat pedal is designed for you to be able to achieve different expressions on the hi-hat as well for the ultimate playing experience. All these kits lend themselves very well for either a beginner kit, or a practice kit. In this price range you will struggle to obtain the authentic feel of a real kit, so if that is what you’re looking for, you will need to spend more! However, our helpful drum team are here to help if you want assistance in making a choice. For those of you looking for a budget or practice kit, these are only four of my top choices. 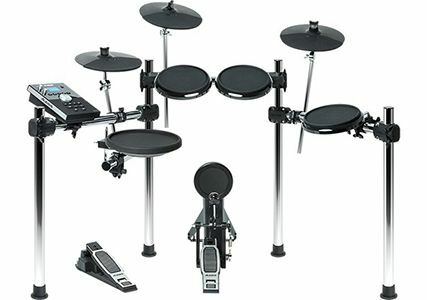 We do sell others for under £600, and you can find our range here: Wembley Music Centre Electronic Drums.